This simple definition clarifies a confusion often made when speaking about Khādi. Khādi is cloth that has been both hand-spun and hand-woven. Cloth where the cotton has been spun by a machine and then woven by hand is called handloom. So why is it so important wether the cotton is spun into a yarn by hand or by a machine? Versatility. When cotton is spun by a machine, the cotton and the subsequent yarn are handled roughly. With Khādi, the cotton has been carefully spun by hand, allowing for a very low twist of the yarn, before being carefully set, by hand, on the wooden loom. This gentle handling of the cotton and the yarn as well as the low twisted yarn allows for the incredible softness and versatility of Khādi. 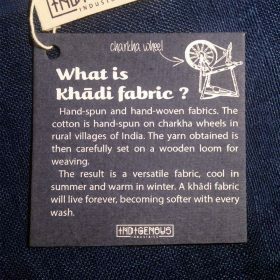 Khādi is known as the wonder fabric of India because of it’s versatility, it will keep you warm in winter and cool in summer. Khādi is a cottage industry that supports families and villages throughout India. Khādi doesn’t create any waste. Khādi is the only textile activity which does not require fossil fuel. The cotton is picked, cleaned, spunned and woven by hand, without electricity. Producing a meter of Khādi requires three litres of water whereas a conventional textile mill would need 55 litres. Finally, we chose Khādi because it is a fabric of an incredible character which follows you through the years, becoming softer with every wash. This 8 minutes short film displays with great poetry the life of Khādi weavers in mid 20th century India.